Place tomatillos in a sauce pan and cover with water. Bring to a simmer and cook until the tomatillos are soft and mushy, but not coming apart, about 10 minutes. Place the tomatillos, garlic, chiles serranos (add one by one to taste for spiciness desired and adjust the heat as you go), cilantro, onion and salt in the blender. Blend until smooth. You may also mash it all up in a molcajete. Serve in a bowl or molcajete, along with the queso fresco and avocado slices. Offer warm corn tortillas or tortilla chips on the side. This salsa may be used to spoon on top of thousands of things; including tacos, quesadillas, eggs in the morning, or grilled meats. 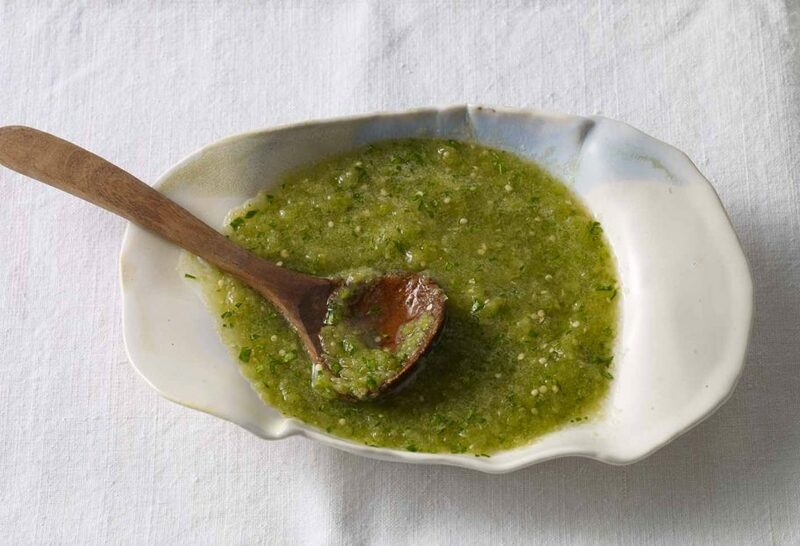 This salsa Verde is fantastic! I love it so much that I grow my own tomatillos every summer. Amazing! I hope your crop is great this summer, Lisa. Hi Dustin, The salsa verde itself will keep in a tightly sealed container in your refrigerator for a week. Add the avocado and queso fresco right before you serve.